Friday morning, the final United States space shuttle mission with humans aboard lifted off. The American dream continues, said the NASA-TV announcer. He didn’t say where, exactly. When it comes to managing $1.9 billion public transportation projects, people don’t tend to talk about things like “adventure” and the “unknown.” But beneath our feet, an impressive journey is beginning on Capitol Hill in an environment that we can’t see and have only just explored. Here is a look at Sound Transit’s twin light rail tunnels from the planet’s surface and some of the things we’ll see as the journey continues below. You might not know it but the adventure has already started. The tunnel boring machine working its way from Montlake to Broadway is already digging your way. 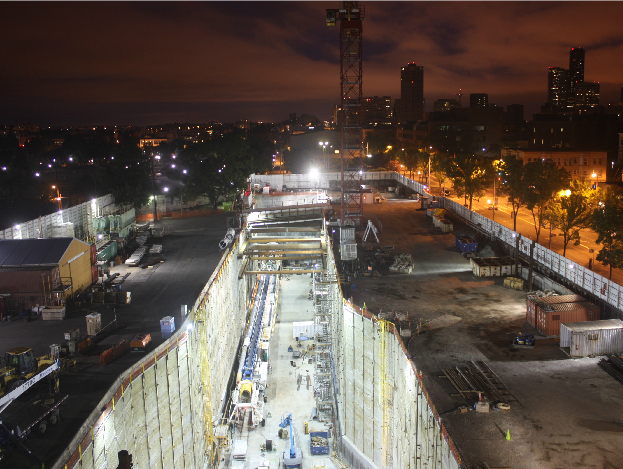 Once crews and equipment settle into pace, the machine will bore 40 feet of tunnel per day. Friday afternoon, a machine will begin to tunnel from Broadway to downtown — a 7/10ths of a mile journey to an extraction shaft on Pine near the Paramount. There, sometime near the end of 2011, she’ll bust through the concrete wall of the shaft, be taken apart and brought to the surface, and then trucked back to Broadway where her journey will begin again on the companion tunnel to downtown. The double journey is a necessity of space — Pine Street doesn’t have the space needed to store and ship out the mounds of dirt the process will remove. The 21-foot diameter tunnels will be a crowded and cramped environment as the trailing conveyor belts, cabling and tracks fill much of the space. As it travels through the earth, the machine and its 10-man crew will place concrete rings to form the tunnel. Dirt from the excavation travels through the machine and onto long conveyor belts which bring spoils to the surface to be hauled away. The belt at the Montlake site, by the way, will be 2 miles long at its maximum reach. Watching the spoil pile grow at the Broadway and Montlake construction sites is one way for those of us on the surface to see evidence of the work going on below. Check out http://capitolhillseattle.com/lightrail for a live cam view. This isn’t Sound Transit’s first light rail tunnel in Seattle, of course, and the agency says it has learned from problems it encountered with “sandy voids” in Beacon Hill. 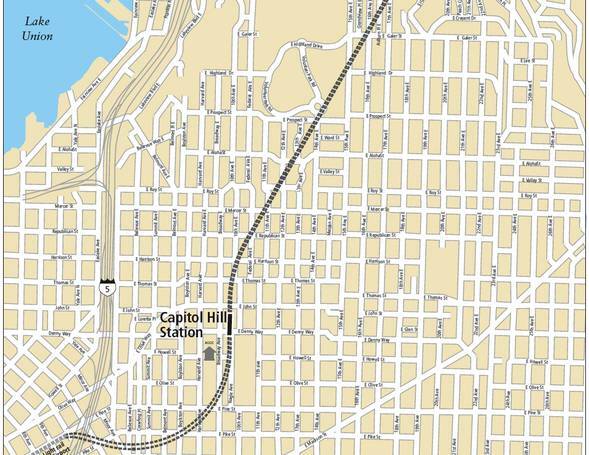 Sound Transit documents detailing the geology and soils of the planned University Link tunnels say the same type of structures exist deep underneath Capitol Hill. Glacial lacustrine deposits were encountered beneath the outwash deposits to the depth of the borings (130 to 160 feet). For alternatives to Capitol Hill, greater thicknesses of pre-Vashon non-glacial fluvial deposits were observed in borings drilled by the PSTC Design Team (2005), which appear to thicken from upwards of 60 to 80 feet of granular soils near the Montlake Cut to more than 130 feet near E Roy Street. Sound Transit dug dozens of test bores across the Hill, some down to about 400 feet near the water tower at Volunteer Park. The results confirmed the comparable geology — layers of clay and sand throughout most of the Hill. But there’s no way to create a 100% certain view of the soil below. Imaging technology for soil remains imprecise. Test bores only reveal so much. There is still room for the unknown. Sound Transit, though, says there’s not much room thanks to three factors it believes should help the Capitol Hill project avoid the problems with voids created in Beacon Hill. The most important of these is an increased understanding of the importance of maintaining constant and balanced pressure on the soils around the boring machines. As the machine’s massive cutter head chews through the earth, a chamber behind the head swallows the dirt and mixes it with a soapy foam that makes the soil easier to move. The key is to keep that chamber just full enough that the outward pressure matches the pressure exerted by nearby earth and water. “You only want to take out what you need to take out,” said Rick Capka, construction manager for the contract U-230 portion of the tunnels from Broadway to downtown. In addition to the monitors helping the crew maintain the proper EPB, systems will also monitor the amount of grout being used to seal the tunnel as the concrete ring segments are added along the route. An unusual amount of grout could indicate a reduction of pressure on the tunnel. And reduced pressure could mean, yes, a sandy void. One last straightforward and relatively obvious step should help the Hill’s tunnel boring machines do a good job. Materials — dirt, rocks, mud, etc. — will be weighed as they are removed. An unusual amount of dirt — either too much or too little — could indicate something is amiss and trigger further investigation. Boring will pause, more intelligence will be gathered and, if a void has been created, a crew will pump the area full of a cement-based mixture and shore up nearby soils by pumping more of the grout into drilled holes to reinforce the area. Back up top, the adventure will play out in less exotic but equally important ways. In addition to giving you a better understanding of the process, Sound Transit’s various monitoring technologies also serve as indicators of the progress below. Starting in a few weeks after the start of boring at the Capitol Hill site, the Broadway station construction area will transition into a 24-hour-a-day operation. Remember that whole earth pressure thing? 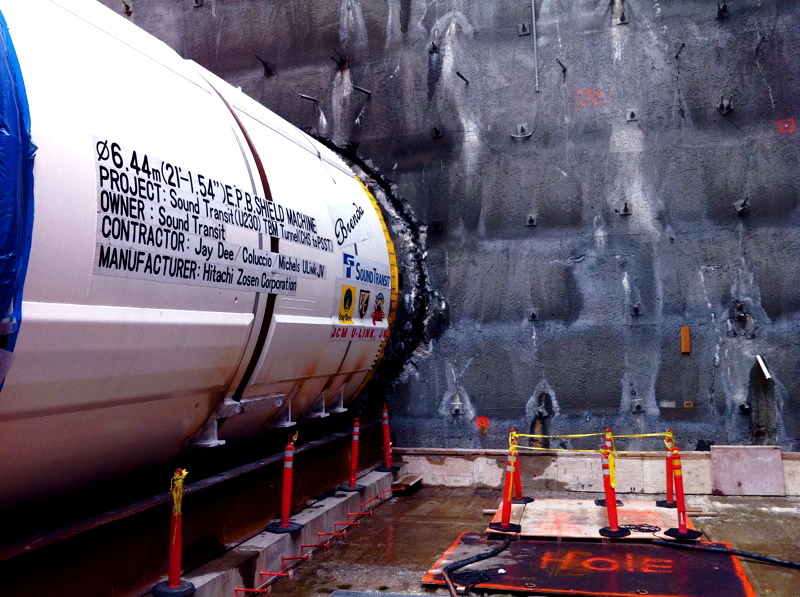 Sound Transit says its safest to operate the tunnel boring machine continuously. That will mean non-stop operations in the tunnel — and above as spoils are brought to the surface and support work continues at the station area. Some 735 settlement point markers line the path the tunnels will follow between the university and downtown. 473 of these are attached to buildings and structures along the route. It is measurement and monitoring by brute force. As the boring progresses, teams of surveyors will fan out across the Hill to record the positions of the surface markers. Any change in position will be evaluated for its potential as a sign of problems below. Sound Transit logs photographic and video information for every structure along the route. In Beacon Hill when a church complained that cracks had developed on its property, the agency was able to show that the cracks had been there all along thanks to the imagery. 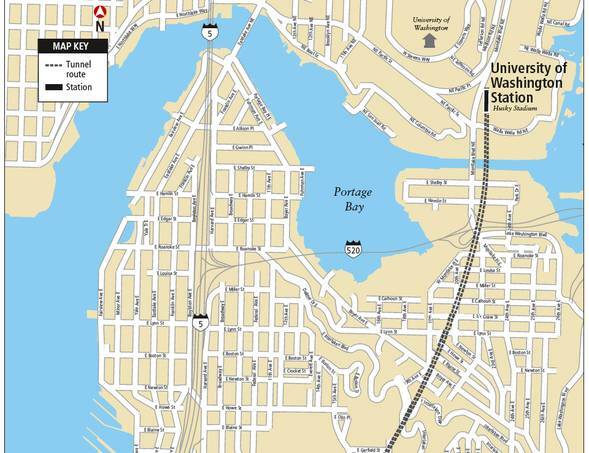 Between Husky Stadium and downtown, the twin tunnels will be dug beneath about 250 homes and several municipal structures at depths between 15 feet (beneath the Montlake cut) and 300 feet (beneath Volunteer Park) below the surface. The deepest digging past Broadway will bottom out at a still impressive 150 feet below the pavement. The survey crews will serve as a kind of indicator of the boring machine’s progress. The crews will be found on the leading edge of where the machine is moving toward and, then, again, as the machine moves through an area. 66 extensometers will monitor any movement of the soil at depth near the bored tunnels’ paths. The devices are basically long cables — some on the route as long as 400 feet — that will hang down shafts already drilled to where the top of the 21-foot diameter tunnels will be. The extensometers log data and transmit it wirelessly for ongoing analysis of the route. They’re more expensive so are deployed strategically near critical points. In the areas of loose soils created by ancient landslide deposits on the north edge of the Hill and on both sides of I-5, Sound Transit is deploying devices called inclinometers to monitor for movement on the slopes. The inclinometers measure tilt. Any change in the degrees measured could indicate instability in the soil below. Sound Transit isn’t sure yet how it will communicate progress on the tunneling. Regular monthly bulletins on the U-Link project will continue and there should be a few Twitter updates along the way, a spokesperson says. CHS will be watching the spoils pile up and be carted away to disposal sites contracted to take the Capitol Hill mud in places like Snohomish County and beyond. You can watch for survey crews and listen for the hopefully not-too-loud hum of machinery with the Broadway site shifted into round-the-clock mode. All in all, it won’t match the excitement of a shuttle launch but as far as that whole American dream thing goes, a subway running from the airport to our largest university — and through the heart of our very own neighborhood — is a good start. This is a great article, and you obviously put a ton of time into it, thanks! This got me thinking… I’ve been telling people the “300 feet below the surface! !” number, and now I realize that only at a few points in the train’s journey will it be that deep. At Broadway and John, we’ll be able to go down a few flights of stairs to get to the train, right? There will be escalator/elevator options, too? I saw sketch proposals for the interior of the building once, but I can’t find them now. Great post! This answered dozens of questions I had sitting in the back of my mind about the process and how they prevent cave-ins. Very nicely written. You’ll recall that Dan Savage has coined a term for penetration by a female. What are they doing with the dirt that’s being removed? Where does all that Capitol Hill dirt end up? With about 50,000 cubic yards of dirt removed from Capitol Hill so far, we wondered where the soil was ending up. So we can claim the new territory for our own, naturally. Sound Transit tells us that their contractors “own” the dirt they excavate and control where and how it’s disposed per contractual requirements that keep it from being disposed of improperly. The contract is set up that way so that the contractor assumes the risk of changing disposal costs, not Sound Transit. A contractor will typically use multiple disposal sites due to variability in material properties, fluctuations in the market, Sound Transit tell us. One current destination is the AAA Monroe Rock Quarries site located at 15421 166th Street in Snohomish. Nice article. Great job of swallowing Sound Transit’s line. We’ll see how it all works out. I’m sure those on Beacon Hill whose yards disappeared into the sink holes caused by ST will be comforted by your post. Sound Transit: We don’t care, we don’t have to. Can you point out an instance on Beacon Hill where ST didn’t right a wrong they caused? Great job with the trolling. Looks like someone’s mad because they didn’t make it in to train driver school.